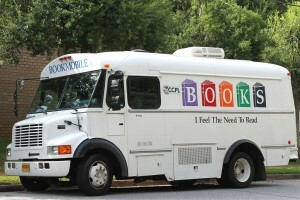 The CCPL mobile library, also known as the Bookmobile, is an outreach service, taking books and library materials to the citizens of Cherokee County who may not have access or means of using the Main Library or the Blacksburg Library. 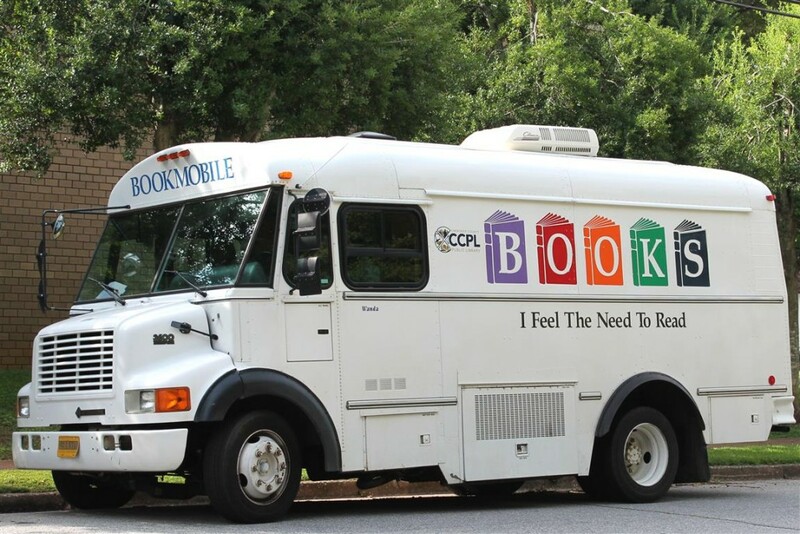 The Bookmobile currently provides library service to schools, daycares, senior centers, apartment complexes, neighborhoods, and various community agencies that serve children and adults. For more information on routes and schedules, call the Main Library at 487-2711; from the main phone menu, press “5”. The library provides delivery of books and other library materials to patrons who are homebound due to physical disability or extended illness that prevents them from coming into the library. Applications for this service must be made by the person or caregiver, and approved by the Library Director. Library users may place a reserve on a specific item that is currently checked out or for which there is a waiting list. 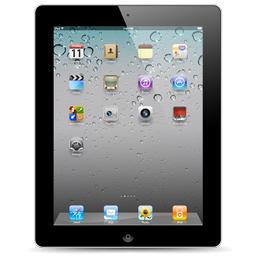 When the item is returned or available, it will be held for them in the Ready Reference room for a specified time. Reserve items will be held for seven (7) days for notification of the user. A library user may have not more than ten (10) outstanding reserve requests at any one time. Library users should notify the Library if they no longer need a requested item and wish to be removed from the waiting list. Reserves may not be placed on items from another library that were added to the collection in the previous six months. Library users must have a valid South Carolina Driver’s License or DMV identification or other official photo identification with pre-printed name and current residential address. County residents or county property owners and persons working or attending school in Cherokee County are eligible for a free borrower’s card with proof of status. (Non-residents may receive library privileges upon payment of an annual non-resident fee of $10.00.) Lost or damaged library cards may be replaced at a cost of $5.00. Children of any age are eligible for a library card. For applicants under the age of 16, a parent or legal guardian must be present with the applicant to sign the application. Parents or legal guardians must have or acquire a Cherokee County Public Library card in order to sign for the child’s card. Please notify the library immediately if a library card is lost or stolen, or if there has been a change of name or address. For more information, please read our Circulation Policy. Internet access is provided through public computers for library patrons at both library locations. Patrons must have or obtain a library card, and must bring their own library card with them each time they wish to use the internet. Patrons ages 6-12 years old must have their parents or legal guardians sign for them to use the Internet. Children in this age bracket must have a parent or adult sitting with them at all times while using the Internet. Patrons 13-17 years old must also have parents or legal guardians sign for them to use the Internet. Young adults in this age bracket may use the Internet without a parent or guardian present. Non-residents wishing to access the Internet may do so by signing a temporary Non-resident Agreement Form. Proof of identification (e.g., a driver’s license) will be required each time the non-resident uses the Internet. Non-resident agreements expire in 30 days. After the 30 day period, non-residents may purchase a library card for a fee of $10 annually. Time limits have been established for public computer use and vary by library location. The library offers wireless Internet access points at its Main Library and Blacksburg Branch during normal library business hours. The wireless access is for users with properly equipped portable computers or mobile devices. Wireless connection to the library’s Internet service is free of charge and available to users within the broadcast range of an access point. All Internet traffic across the library’s network is filtered to comply with CIPA regulations. Use of these access points is governed by the Cherokee County Public Library Internet Acceptable Use Policy. The library provides interlibrary loan services to its patrons through contact with other libraries in the state and nation. Ask the library staff for more information if there is a book or information that is not available in the library’s collection. The Heritage Room at the Main Library is open Monday, Wednesday & Thursday from 10 am – 1 pm and 2 – 5 pm, Tuesday from 11 am – 1 pm and 2 – 5 pm, and Fridays when staff is available. Staff are available during these hours to assist with research needs, copies, and use of microfilm equipment. Resources available include Census records; microfilm copies of our longest-standing local paper, The Gaffney Ledger, dating back to its inception in 1894; an extensive Cherokee County collection (including family histories, cemetery records, church records, and other sources); DAR references; as well as South Carolina records and some out-of-state information. Access to two online genealogy databases, Heritage Quest and Ancestry Library, is available in the library. Heritage Quest is available remotely to Cherokee County Public Library card holders by accessing “Home Access to Databases” on the library’s website. Contact the Heritage Room at 864 487-2711; from the main phone menu, press “4” to request assistance with genealogy questions or to ask about genealogy and local history resources. A special place to visit while at the main library is the nearby Caldwell House, a quaint, two-story, stylishly renovated building that serves as home to the Friends of the Library. Browse the wonderful selection of new and gently-used books that are for sale. Hours of operation are Tuesday, 10:00 am until 6:00 pm, Wednesday and Thursday 10:00 am until 4:00 pm. 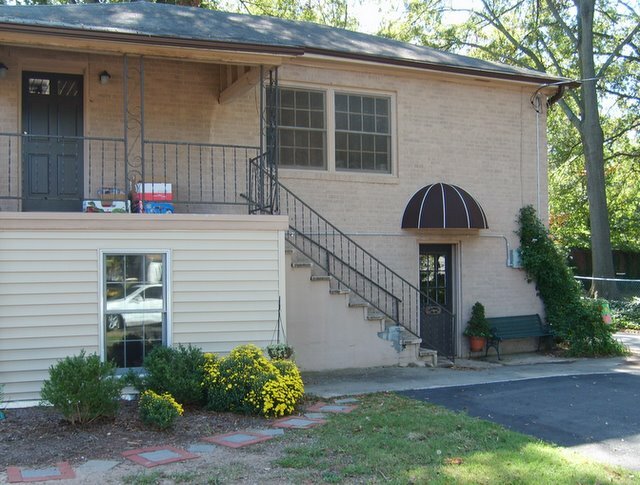 Both the Main Library and the Blacksburg Branch have meeting rooms available for public gatherings of a civic, cultural, intellectual or charitable nature. Meeting space for commercial (for profit) groups or organizations is not available. Group representatives should contact the library location of their choice for meeting room guidelines and availability. The library staff will assist with brief reference questions by phone or email. Call 864 487-2711 or email your question. Members of the library staff are available to speak at community events, schools, and club meetings to share information about services the library provides. Library tours can be arranged by contacting the Public Services Manager (adult groups), the Youth Services Manager (children and teen groups) at the main library, or the Branch Manager at the Blacksburg Library.